Mike and his teammate Jay Henry endured blowing snow, freezing temperatures and even a few wrong turns in the dark to claim another victory at the eleventh annual Elk Mountains Grand Traverse on Saturday with a time of 9 hours and 4 minutes. Jimmy Faust and Pat O’Neill of Crested Butte, who have won the race three times, finished in second place. The race was neck and neck for the two top teams from start to finish. For the first time this year, both the Nike team and the CB team choose to wear lightweight AT skis and boots instead of nordic gear. On the rolling terrain atop Richmond Ridge, just a few miles from the top of Aspen Mountain, Mike and Jay kept their skins on while Jimmy and Pat skied the downhills and bootpacked the uphills, gaining time and eventually passing Mike and Jay. Cresting the final hill to the top of Aspen, Mike and Jay stripped their skins and skated back into the lead, while Jimmy and Pat had to click back into their skis. 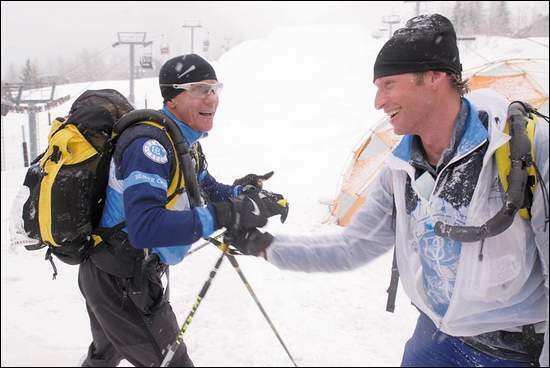 Mike and Jay skied down Aspen Mountain through several inches of new, wet, heavy snow all the way to the finish line at the base of the gondola, three and half minutes ahead of the CB team. Jay, a ten year veteran of the pro mountain bike circuit, said it was one of the hardest races he’s ever done. Mike now has a won the Grand Traverse a record four times. The Aspen Times has a full account of the race here. And Scott Willoughby from the Denver Post wrote a great story as well.